Born on August 1, 1770 in Caroline County, Virginia, William Clark was the ninth of ten children born to John Clark, III and Ann Rogers. Of modest means, his parents were common planters and Clark received no formal education. Instead, he was taught at home, but would grow up to be self-conscious about his grammar and inconsistent spelling. His five older brothers fought in Virginia units during the American Revolutionary War. His oldest brother, Jonathan Clark, served as a colonel during the war, and later rose to the rank of brigadier general in the Virginia Militia. His second-oldest brother, George Rogers Clark, rose to the rank of general, spending most of the war in Kentucky fighting against British-allied American Indians. In March, 1785, Clark, with his parents and three sisters moved to Kentucky, settling near Louisville. There, his older brother George Rogers Clark taught William wilderness survival skills. In 1789, he enlisted in the army and stationed in the Ohio valley, which protected the Kentucky settlements from Indian attacks. In 1791, he fought against the Indians under General Charles Scott’s command in the Battle of the Wabash in present day Ohio — part of the Northwest Indian War. He was lucky to have survived as the conflict was one of the worst defeats, in percentage of casualties, ever suffered by the United States Army. It was also the largest victory ever won by American Indians. Four years later, he was transferred to General Anthony Wayne’s unit and was named Lieutenant in command of the fourth brigade. Meriwether Lewis was later placed in the unit under Clark’s command, and the two developed a deep friendship and respect for each other. After having served in the Whiskey Rebellion of 1794, he left the Army and returned to his family. A few years later his father died and Clark inherited a large amount of land as well as some slaves, among whom was a man named York, whom Clark had known since childhood. During those years, Clark also met and married Julia Hancock. In the meantime, Meriwether Lewis continued his military career and was soon serving as President Thomas Jefferson’s private secretary. In mid-1803, after Congress had approved a wilderness expedition that had been a pet project of Lewis’s since 1792, William received an invitation from Lewis to co-captain the expedition. Clark eagerly accepted, bringing along his childhood friend and slave, York. Although Lewis and Clark believed they would share the captaincy of the Expedition, word that Clark would remain a lieutenant arrived shortly before they departed St. Louis, Missouri. The men of the Expedition, called the Corps of Discovery, having spent a winter addressing “Captain Clark” were not told of the difference between their two leaders. For the next three years, they and their men explored the vast uncharted area newly acquired in the Louisiana Purchase. 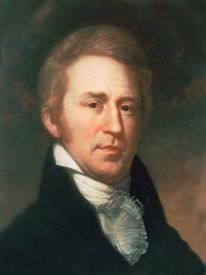 William Clark’s contributions to the Expedition were those of a captain. The map he created as they traveled was, at the time, the most accurate map of the trans-Missouri West. His stable personality balanced Lewis’s moodiness. And when Lewis’ pen fell silent during many months of the journey, Clark’s words, straightforward and creatively spelled, became the record of the Expedition. William Clark also left his mark along the Trail. On July 25, 1806, Clark scratched his signature into a sandstone formation along the Yellowstone River in Montana. 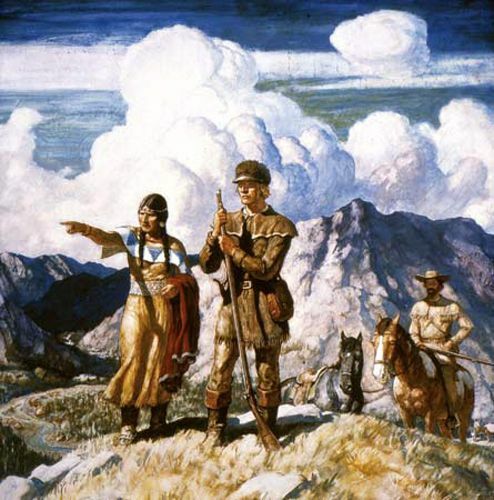 Recording the event in his journal, Clark noted that “this rock I ascended … had a most extensive view in every direction…I marked my name and the day of the month and year.” He called the formation Pompey’s Tower, using a nickname Clark had bestowed on Sacagawea’s son Jean Baptiste, or Pomp. The etched signature can still be seen at the site, now called Pompeys Pillar, near Billings, Montana. Clark’s signature is believed to be the only remaining on-site physical evidence of the expedition. Having crossed a continent, Clark returned to St. Louis to build a successful and varied life of family and work. For his success in the expedition, President Jefferson awarded him 1,600 acres and made him brigadier general of militia for the Louisiana Territory as well as superintendent of Indian affairs. In addition to fathering seven children, William Clark temporarily cared for Sacagawea’s son, Jean Baptiste. After Lewis’s death, Clark completed the work of the Expedition by helping to prepare the journals for publication. Clark’s fair diplomatic relations with American Indians during his years as brigadier general of the militia and Superintendent of Indian Affairs helped him to obtain the governorship of Missouri Territory, which he held from 1813 to 1832. Clark died of natural causes in St. Louis on September 1, 1838 and is buried in the Bellefontaine Cemetery in St. Louis. One hundred sixty three years after his death, William Clark received a promotion. In 2001, President Clinton promoted Clark from Lieutenant to Captain. Although Clark’s captaincy was late in coming, to have called the famous journey of 1803 to 1806 simply the Lewis Expedition would have been inaccurate in spirit, if not in fact. Meriwether Lewis and William Clark shared equally in the tasks and responsibilities of their cross-continental journey.